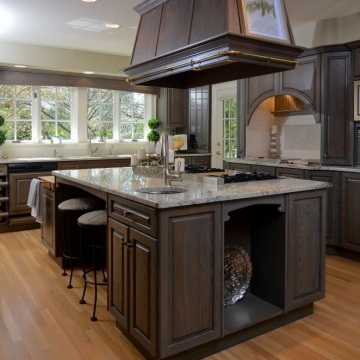 Mountainwood Homes is a residential design/build company that renovates the old and builds the new around Portland, Oregon and Southwest Washington. Since 2008, we have been committed to providing our clients with the very best experience – and to refining it every day. I am likely to recommend Mountainwood Homes to a friend. Mountainwood Homes stayed within our agreed upon budget. 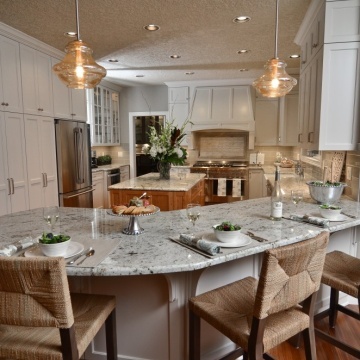 Mountainwood Homes had the necessary expertise to manage my project. Mountainwood Homes effectively addressed and resolved problems. Mountainwood Homes adhered to our agreed upon schedule. I trust Mountainwood Homes to follow through on commitments. The Mountainwood Homes salesperson was knowledgeable and helpful regarding my project. The project manager is knowledgeable and professional. I feel I received a fair value for my money. 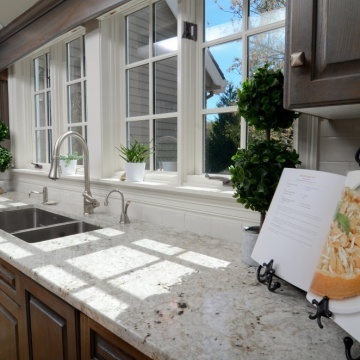 Mountainwood Homes delivers an exceptional customer experience. The design solved my remodeling needs. The designer was knowledgeable in the product selection and design. 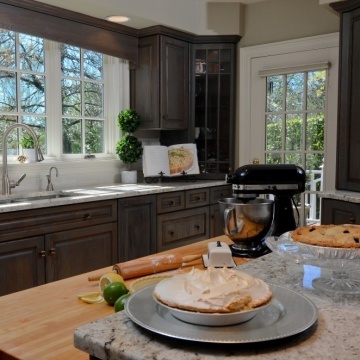 Trade partners of Mountainwood Homes are professional and courteous. We really enjoyed the hands off feeling after the design process was complete. It felt like we handed over control of our home to MWH and felt like they had it all under control. It was such a great feeling to know that you didn't have to carry the burden of the project on our shoulders. We also really enjoyed seeing a busy upcoming week in BuilderTrend and then walking onto the job site and seeing numerous trades working simultaneously. The strict attention to the schedule was extremely appreciated and exceeded our expectations. David B. was always keeping us informed and very attentive to our questions and concerns. Everyone! I think it was a team effort and MWH had an excellent and very competent team. It felt like the team was always firing on all cylinders as opposed to our fear that the right hand doesn't know what the left is doing. Having a daily schedule and finishing on schedule. A more costly remodel than we had hoped for and would have appreciated more cost-saving suggestions at the outset. To their credit, they did stay within the agreed-upon budget, with the only major unexpected ad-on being the bill for asbestos abatement. Chad is an exceptional project manager- by far the best we have ever worked with. We very much enjoyed communicating with Craig, who was on site nearly every day and did much of the actual work. He is a solid professional whose experience was quite evident. Over the last 45 years since I bought my first house, I had learned to distrust all four of the previous remodelers I had worked with. My faith has been restored. I am a solid fan of Mountainwood Homes and highly recommend them, (and I'm not being compensated to say so). They did an excellent job and were so good to explain everything - what they were doing and why it needed to be done. I am going to get them back to doing something in the basement. The design plan was really perfect. They met/exceeded my expectations with the bathroom remodel. They made it so much more functional with the built-ins and the flooring is exceptional. I would like to recognize David and Sierra. They were all good. I would definitely use them again and am planning on doing so I am so happy I met them at a home show a couple of years ago. Had I not gone to that show, I would not have know about them. Love the design and completed railing project. Adam did a great job communicating. The quality of the work was good and finished on time. Picking the tile and fixtures was fun. I love the way the bathrooms look, my new closet doors and the kitchen counters and back splash. Like I said David was very good. He always responded to my calls and texts sooner than I expected. They were a week later than the original estimated date but that was largely due to change orders we introduced. I really enjoyed a lot of parts. The design phase was super fun as was helping with the demo. I really enjoyed the day to day decisions and discussion about what was to come next as well. The people. Chad, Jean, Lee... all exceptional. We looked forward to our interactions with each. The guys from the crew were amazing too (Craig, Ricardo, Dustin). Chad, Lee, and Jean all went above and beyond to make us happy and to make sure we were getting what we wanted. They were patient with me asking a million questions and insisting on multiple rounds of revisions. 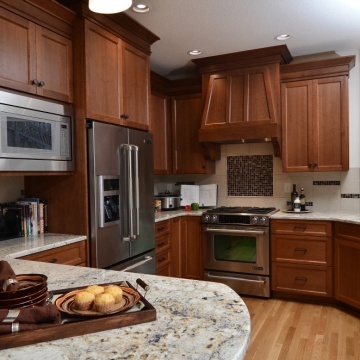 We have recommended Mountainwood to anyone who have asked about our remodel experience. We have been very happy with the Mountainwood team in all elements regarding our current remodel. Even though we went considerably above budget, Mountainwoods process is set up so that the customer has a reasonably good idea of the cost parameters presented in the project. We did encounter a few surprises during the remodel cost wise, but many of the over budget items were at our request in change orders to get what we wanted for the best outcome for our remodel. We did ask for additional cost breakdowns so that we could better understand where the dollars were spent and where the over budget items effected the bottom line of the project. Mountainwood in our experience has always been very good with problem resolution. This has always been a strong point in the Mountainwood relationship. There is always been a very clear understanding and extra time taken from our salesperson in defining elements of the remodel. This a foundation element that sets the stage for a good project. Moutainwoods design process is well set up and helps us (the customer) focus on the projects needs for the outcome to be successful. 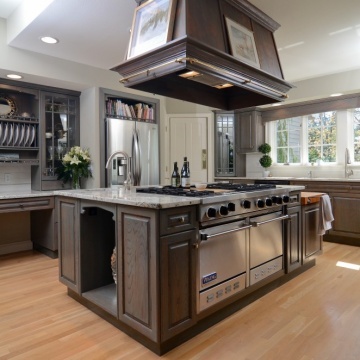 With the multiple choices one needs to make in complex remodels, we have found this to be an important element in making any project work smoothly. So we are always happy to have project ideas evaluated and reviewed. We appreciate the extra time and effort put into the project design. So thank you Heather and (newbie) Shelly for your work in making a great outcome. Our project manager has always been outstanding. He has been a good addition to Mountainwoods team so we were very happy to have him on the project. He listens, works well with people and can take kindly criticism ( ok off beat attempts of humor from Moutainwoods best customer) even under very stressing project moments. Another strong point for Mountainwoods customer relations. With their excellent warranty program we feel confident that any issues we have with any elements of our project will be taken care of with no hassles. 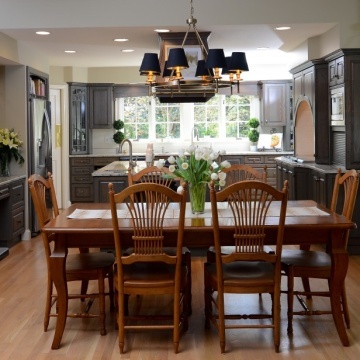 Mountainwood may not be the cheapest on the block, the extra time that they take with each project, the attention to detail, and total willingness to satisfy the customer is one o the reasons we come back to Mountainwood. Although we are not finished with our three phase project, Motuntainwood continues to meet the high expectations we have of them that they set with our very first project several years ago. The Mountainwood process …. the end result … the prep and cleanup and Mountainwoods warranty program. The repeat customer discount. I would give the company a six if I were allowed. Jean was an absolute all star during the process. Initially I did not want to meet with a design team but now I'm amazed at the finish project. They walked thru every possible selection and she stayed in budget and researched my family and needs that were all implemented into the design. My family is convinced he is Chip Gaines. He is a constant professional and his attention to detail was outstanding. He resolved any scheduling problems that propped up. I would highly recommend Greg as a project manager to anyone and you will not be disappointed with the end result. 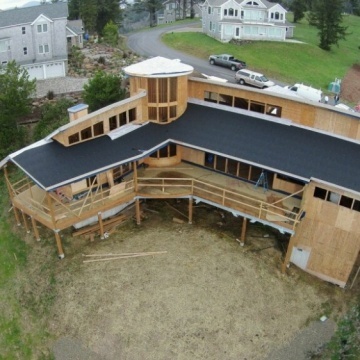 Phil who owns a framing company encountered one issue after another that he was able to resolve and keep on schedule. He treated our family and site with respect. We were sad to see his team leave. Every worker worker treated my family with respect and courtesy. They are still coming back and making touch ups and do not complain and respond very quickly and are very committed. I would hire and wait if I had to for Greg to build my second home. They came in on budget and on time and I would trust them again. The look on my wife's face when she walked in for the first time and saw her dream home for the first time. They exceed in every category we have discussed, there is not any criticism that I have. I would like to recognize Greg, Phil, Gene and Eddy for if it was not for all of their efforts I would not have received my dream home. I can't thank all the workers enough for making this house possible for my family. Major things were finished exactly on time, a few follow ups were complete the week after the completion date. I really appreciate the effort to scramble and replace the lemon of a dishwasher just in time for me to host Thanksgiving! Overall the job is really high quality and was so well managed, I'm very happy with it. As I gut check the total cost with friends who have done similar projects, it does feel a bit high - but then again I do believe I got what I paid for and the efficiency and quality of the work is hard to put a monetary value behind! Everyone's friendliness, courtesy in my home, and responsiveness to my needs! We are very happy with the result of the masterbath. Thank you! Everyone who worked on my project demonstrated high levels of expertise. The quality of work was excellent and I’m 100% satisfied with the outcome! Mountainwood Homes demonstrated creativity and flexibility with problem resolution, and they earned five stars for their positive communication, willingness to accommodate my needs, and sense of humor. Five stars for sourcing the elusive heat-resistant paint for the master fireplace surround - it looks great! Greg was terrific to work with! He answered my calls promptly and kept me updated on the project schedule by phone or text. He was very accommodating with helping me get the house in order for guests while we were waiting for the tile, and he resolved my concern about the change order charge for the gas line fairly and promptly. All of the trade partners were terrific. Please share with the tiler, Sergei (spelling? ), that his work was outstanding. He was meticulous, a perfectionist, which was important with the tile choices I made. I appreciated the care he took as well as the pride he demonstrated in his craft. Meeting all of the Mountainwood employees and trade partners. Without exception, all were nice, fun people and all cared about their work. I also enjoyed watching the project unfold, and of course, loved the final outcome. I can’t pick any one person. Everyone I encountered was clearly dedicated to providing a good customer experience. Mountainwood Homes has a terrific team! Remodel's can come with a lot of worry. I never worried with Mountainwood Homes. Super professional and easy to work with! 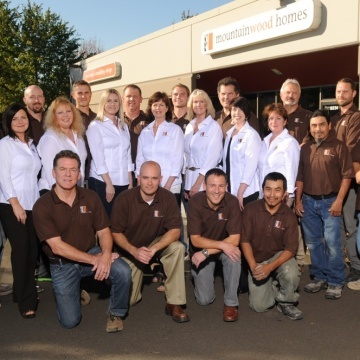 Mountainwood's customer service is what sets them apart from everyone else we've worked with in the past. 100% In fact were saving up now for our next project! The people, our designer Shelly and project mgr David were always only a text away. And so great about changes and schedules. They were on time! And they had an unexpected gorgeous fix for our backsplash problem. It's so pretty, it's become one of our favorite things about the new bathroom. And it was a solution to a problem! Tino and Jose! We loved everyone but these two were at our house almost every day and they were always delightful. For people that are in your home every day that's huge! Choosing a contractor is a big decision. 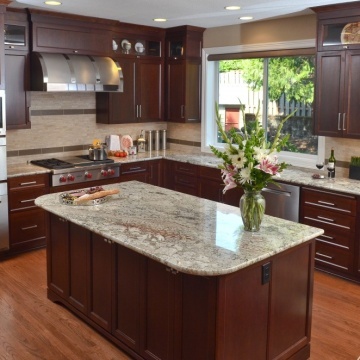 Choosing Mountainwood Homes was the start of a great remodel and relationship. We will use them again for our next project. No question! Would not recommend to engineers or people with diverse outlook! Yes for typical, mainstream tastes. David rocks. I would recommend him to anyone!! Excellent listening and managing, and executed the project flawlessly to the schedule. This phase of the project was a pleasure. I would like to recognize Chad for his exceptional service. She the best. I love what she pick out. David was fantastic. Wonderful to work with. very professional to work with, on the ball addressing my questions. Husband already called to speak with Mr. Wood to communicate all persons involved did an excellent job. The design assistance we got from Sierra was very helpful. We had tried to pick out tiles and fixtures on our own before without luck but it went very quickly with her help and we were able to make all our selections within a couple hours. We also started with a design we liked and Mountainwood Homes was able to redesign our project in a way to keep it within budget but meet our design goals. Quality of work, communication and addressing our concerns. Made little improvements to the design along the way. Attention to detail. I feel like we kind of got screwed. We initially had someone else give us an estimate. Then he dissolved his company and he started working for Mountainwood after we signed the contract. He offered a cost-plus contract and they typically don't do that. In the meeting when we signed the new contract they brushed it off and the cost ended up being 100,000 dollars more than the estimate was. I feel like that is not acceptable. We trusted the estimate. They are supposed to be experts in their field and I don't feel like they were. I have already recommended two different people to you. Selecting materials and being able to confirm selections, etc., online via the app. stayed on schedule and finished in a timely manner,as promised. David was professional and very easy to contact. 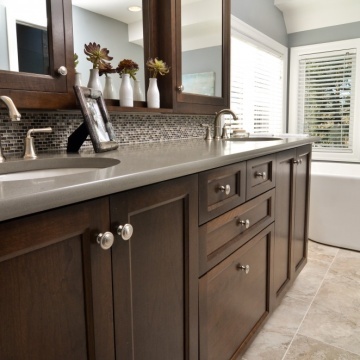 Before we started working with Mountainwood, we really had no strong ideas on design or finish selections. Ivan came up with great layout design options and the 3 D drawings really helped us to visualize. 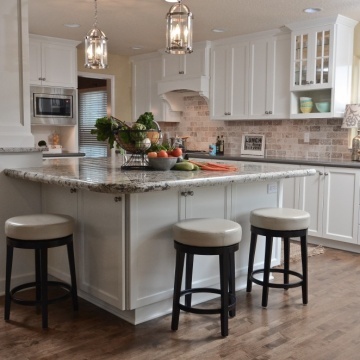 Jean was able to take a few inspiration photos and then walk us through selecting the finishes and create a kitchen we love! Communication with everyone at Mountainwood was so easy. Buildertrend was a great way to track the job, as we always knew the schedule, budget, could make payments and check out photos. Any small problems were addressed and corrected immediately. Ivan, Jean, David and Gaspar were all fantastic to work with.